NEW YORK (AP) — Over 3,000 low-level marijuana cases were thrown out Wednesday as Manhattan’s top prosecutor furthered a shift away from arresting and prosecuting many people for small-time pot offenses in the nation’s biggest city. Misdemeanor and violation-level pot possession cases that had sat open for as long as 40 years were dismissed in a matter of minutes after Manhattan District Attorney Cyrus R. Vance Jr. asked a court to scrap 3,042 warrants for people who missed court dates and to toss out the cases themselves. He recently decided to stop prosecuting many minor pot possession cases and argued it made sense to spare people potential arrests in old ones. None of the people charged in the cases was there to hear Criminal Court Judge Kevin McGrath wipe them out. Some may long since have forgotten about the cases. But now they no longer face potential problems getting jobs or housing if the warrants pop up during background checks, or possible arrest if their IDs are checked during otherwise routine interactions with police — after a fender-bender, for instance, or while reporting a crime. “They are living with the peril of being put through the system for almost no reason,” said Carolyn Wilson, director of New York County Defender Services. Her group and Neighborhood Defender Services of Harlem are ready to help people seeking to figure out whether the dismissals affect them. Vance and Brooklyn District Attorney Eric Gonzalez decided this summer not to prosecute most new misdemeanor pot possession and smoking cases, saying they had little public safety impact but caused defendants problems with employment, housing, immigration and more. The two DAs oversee prosecutions in two of the city’s five boroughs; all five DAs are Democrats. Gonzalez announced a plan last week that could erase an estimated 20,000 minor pot convictions. 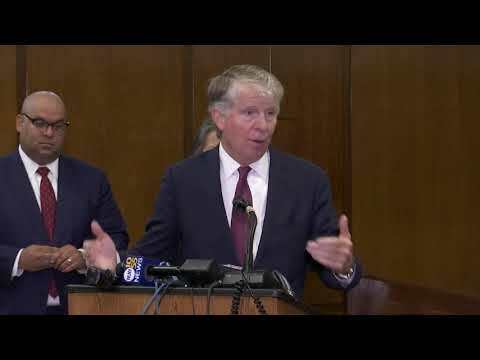 Queens DA Richard Brown’s office said it would review any misdemeanor marijuana possession cases there that haven’t been dismissed. Vance said Wednesday he was exploring the legalities of potentially voiding old convictions but hoped state lawmakers would create a certain path for doing so. For now, he said he was using prosecutors’ discretion to drop open pot-possession cases and warrants as a move toward fairness. New York allows marijuana-derived medications for some conditions, but recreational pot remains illegal, although Democratic Gov. Andrew Cuomo has appointed a panel to draft legislation that could legalize it. Meanwhile, New York City has been easing policing of minor pot possession, which spurred more than 50,000 arrests a year as recently as 2011. Last year, there were 17,880, according to the state Division of Criminal Justice Services. A 2014 city policy called for police to issue summonses citing violations, instead of making misdemeanor arrests, for most low-level marijuana possession cases, though not public pot smoking. As of Sept. 1, officers also have been directed to issue tickets in most marijuana-smoking cases. City prosecutors have previously agreed on voiding vast numbers of warrants, if not focusing on marijuana ones.